A big thank you to everyone who linked up last week. We had some amazing projects linked up last week. I haven’t been on my sewing machine in two months; ever since I finished sewing my best friends burlap table cloths for her wedding. The blog world has inspired me to get sewing again! I can’t believe this is the last full week of April. Unfortunately, it doesn’t look like Mr. Woodsy & I will have our bedroom complete by next week; unless we push it peddle to the metal and begin painting our dressers and night stands and make our mirror and buy our chair and light fixtures. But until then–I’m ok with it. We have family coming into town mid-May so that’s our new goal. I realize that life happens and we can’t always complete our projects when we want them complete. I also realize that we pay for the projects–it’s not like a work project where everything is supplied to you–you just have to get it done! Speaking about a project; I’m adamant that I will get out our first newsletter next week. I’ve begun building it and I’m so excited to finally send it out. I hope to make it a monthly newsletter. So, if you’d like to receive our first newsletter please don’t hesitate to subscribe! 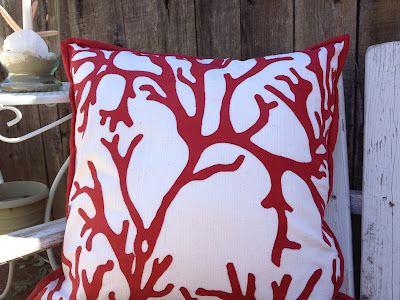 I remember seeing this pillow in the PB catalog and loving it; however, just about fainting at the price tag. This pillow looks just as good if not better than the real deal! 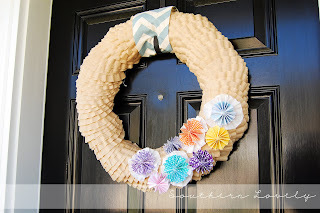 Love this coffee filter wreath and the awesome pinwheels Lindsay made for this wreath! I love the idea of making starter pots out of newspaper. We have plenty of newspaper at our home! How adorable is this chalkboard paint pot. Perfect teacher gift or in Rebekah’s case mother’s day gift for her mom who is a teacher! Love this shirt to skirt revamp. I would have never guessed this was once a shirt! Aw, thank you so much for the feature! So happy to share with YOU!